DLive is a relatively new streaming platform that is hosted on the Steem blockchain. This means you can earn Steem (a cryptocurrency) by streaming on DLive. To understand better on what the Steem blockchain is, do read this article on Steem and Steemit. DLive is a streaming platform that is similar to Twitch or other streaming platforms available online. You can stream all kinds of stuff but the vast majority of streamers prefer to stream games like Fortnite, PUBG, Overwatch and DOTA 2. This is how the homepage looks like if you’re searching for live games to watch. Apart from live streams, you can also watch videos uploaded by users of the platform. Although most streams are games, you’re not limited to them. There are people who do lifestyle streams whenever they are out on an event or a vacation. Some prefer to just talk to viewers instead. There’s no limit to what you can stream on DLive. As the Steem blockchain has no ‘real central governance’, there are also users streaming adult material. You can always filter them if you don’t like to see it. How do you earn streaming on DLive? This is probably the question most potential streamers thought about. If you’re a Steemit user, you should have an idea by now. Otherwise, you’ll have to read the link on what Steemit and the Steem blockchain is to fully grasp the idea. To put it simply, you earn from upvotes by other users or by the DLive crew themselves. How it works is that the more Steem Power a user has, the more value his upvote is worth. So it doesn’t really have to do with how many people voted for you, but how much Steem Power your voters hold. Steem Power is the same as Steem, except that the former is like a fixed deposit and the latter is liquid cash. How do you start streaming on this platform? You need to have a Steem account. You can sign up via Steemit, but it does take days or a few weeks to get an account. That is because they manually check registrants to see if they’re legit or not. A faster way requires money. You can create an anonymous account via anon.steem.network for about 10 Steem. Once you have an account, you can start streaming on DLive using the private keys from your Steem account. You will have a master key, active key, posting key and memo key. All of them serve different purposes and can be used on any 3rd party apps on the Steem blockchain. For e.g. you can use the same keys to login to DTube, DMania, Utopian-io, Steemhunt, Steemmonsters and so on. That’s the beauty of the Steem blockchain. To use DLive, you need the private active key to login. Don’t use your master key anywhere and keep it offline to be safe. Once you’re logged in, just click “Go Live” to do live streaming or “Upload” to upload a video. This is how the interface looks. You have to upload a thumbnail, fill in the required details and go live. Take note of the Server URL at the right side of the screen. 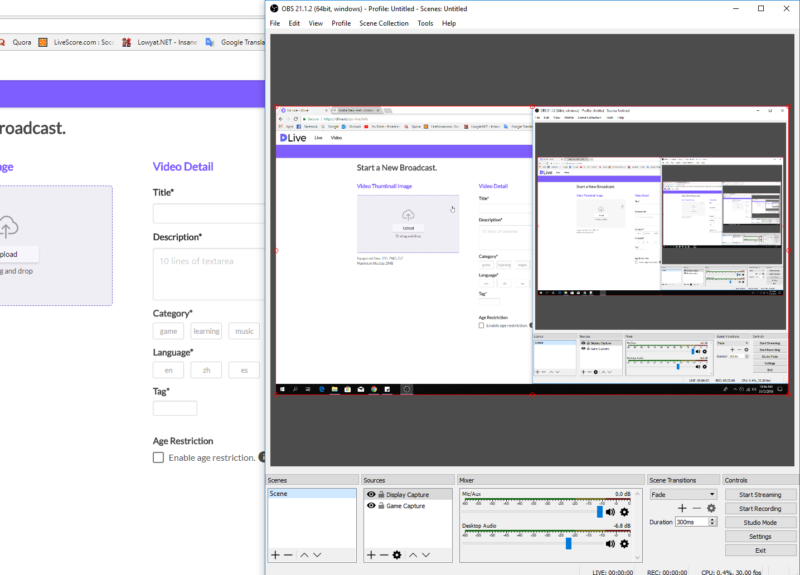 At the moment, you can only use OBS as your program. They don’t accept other streaming programs like Shadowplay. Adjust all of the settings required for the live stream. To access the server, get the server URL from DLive located at the right side of the screen. Click on “Regenerate Server URL”. On your OBS settings, go to “Stream” and fill in the server URL together with the stream key. Both details are provided when you regenerate the server URL. Once you’re done with all of the details, click “Save and go live”. On the next screen, all you’re required is to go to your OBS and start streaming. It’s actually pretty simple once you’ve done it before. How much can you earn on DLive? You may not like the answer, but it depends. It depends on how much Steem Power your viewers have and whether they voted for you. Those with above 500 Steem Power can adjust the weight of their vote from 1 – 100%. Hence, the amount always changes for every stream. Furthermore, DLive crew sometimes upvotes your live stream and as they have a lot of Steem Power, it can be a good amount. For e.g. if you get a $20 upvote, it’s worth quite a bit depending on the value of Steem and Steem Dollars in the market. Do check out how to calculate post payouts here. If you’re not seeing any success on Twitch, you should check out DLive as an alternative. Quite a number of Twitch streamers left Twitch and started streaming full time on this platform instead. You won’t know whether you’ll succeed if you don’t try. Always read the Disclaimer page. Note: The info may be outdated since DLive left the Steem blockchain.